I can not stress enough how important it is to read to your children! If you’re reading this, you probably already agree with that sentiment. Some of the most common complaints I hear are “I’m tired of reading the same books over and over” and “My kid just doesn’t like books”. Well, my friend, I urge you to try again! 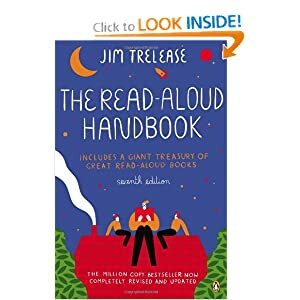 The Read-Aloud Handbook is a must-have for any parents or teachers who are sold (or maybe not sold) on the idea of reading aloud to children. It was given to me as a Christmas gift when I was pregnant with my daughter, and I have loved having it! Since we have been taking regular trips to the library, this book stays in our reading bag for quick reference. I find it much easier to navigate the library when I have a plan (especially with a bouncing two-year-old)! As I began researching, however, I realized that my copy is outdated. I have the fourth version, which is wonderful, but a seventh edition was released this year! My copy is from 1995, so needless to say, it doesn’t have all the latest information on books and technology. It is helpful nonetheless, and I highly recommend snagging a copy of your own! Make sure to get the new version, of course. Jim Trelease has masterfully combined all you need to know about how and why to read aloud to your children with a comprehensive treasury of all the best read-aloud books for kids ranging from infancy upward. Not only does the author talk about how and why to read to your kids, he also addresses our nation’s obsession with television. I found this to be a particularly helpful chapter for my family. What are some of your favorite books to read to your children or students? Can you think of any children’s books that you read for your own enjoyment? Please share them with me! This entry was posted in Books for Educators, Books for Parents and tagged books for educators, children's books, family strategies, parent resources, read-aloud, reading. Bookmark the permalink. Thanks for your post and recommendation of the Jim Trelease book. I didn’t start reading to may babies in utero, but I did start reading to them when they were infants, I started with board books and interjected a lot of sound and emotion. As they got older, I read hardbacks and made many trips to the library with them. Both my children were boys, so we read Eric Carle, Janell Cannon, and Bill Peet, just to name a few. Bill Peet was always a favorite of mine because of the great descriptions, exciting adventure, beautiful illustrations, and variety of vocabulary. When my boys were learning to read, the Usborne phonics readers were a favorite (Ted in a Red Bed, Goose on the Loose, Big Pig on a Dig, Frog on a Log, Hen’s Pens, Toad Makes a Road, Fox on a Box, Fat Cat on a Mat, Shark in the Park). These readers made reading fun and easy. My kids loved to read because I enjoyed it so much. To this day, they are both in high school, they benefit from there ability to read and the vocabulary they learn through reading. I am a special education teacher at a high school. I work with students everyday who never had the benefit of early reading. It’s so sad. They struggle because they have a small vocabulary and cannot maintain sustained attention to read lengthy pieces of literature.